Hamby Home(in)stead ...: Life behind baas?! Our weekday morning routine (since collecting the keys) is to leave our apartment at around 7am and commute to our house. The drive usually takes around an hour, depending on traffic (and/or departure time). We spend an hour or so at the house, which gives Vaughan plenty of time for rabbit-chasing, grasshopper catching and other paddock pursuits before we leave for the 6-7km school-run. 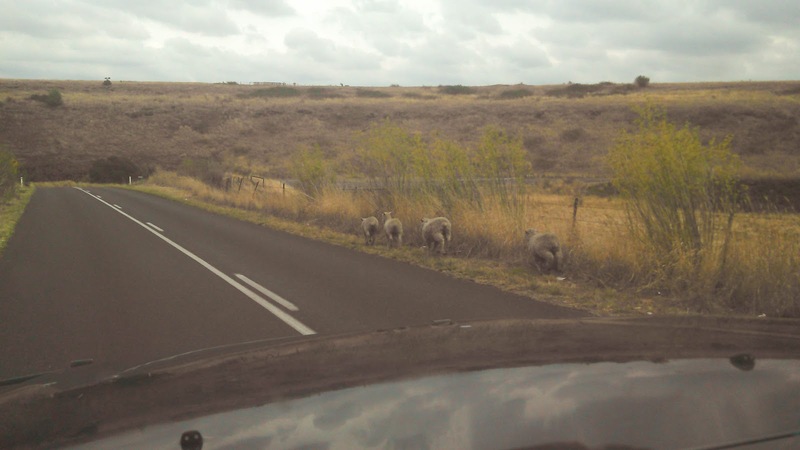 There is a windy stretch of road along the way and we often spot these rogue/road sheep. The number varies but there is generally at least two that obviously prefer roadside living to staying behind baas (hah)!